Participant : Anyone interested in innovation and entrepreneurship. 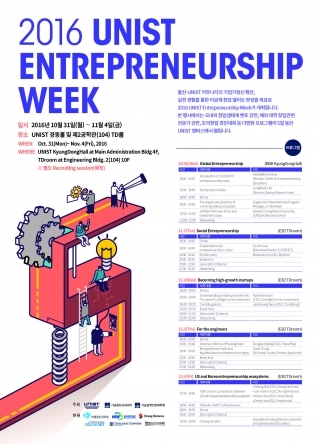 The 2016 UNIST Entrepreneurship Week will be held at UNIST from Oct. 31(Mon) to Nov. 4(Fri), 2016. The event offers a wide selection of the entrepreneurship-related events and lectures. Anyone interested in innovation and entrepreneurship are welcome to join.